Having published so many sporting lists in the past, it is a real surprise to find that we don’t have one that covers the best moments in the most popular sports. With this list, the gap is filled. Be sure to add your own favorites to the comments. The 2007 formula one season marked the first season without veteran driver Michael Schumacher. The season was marked by intense competition between three premier drivers – Lewis Hamilton, Fernando Alonso and Kimi Räikkönen. The Brazilain Grand Prix was the last race of the season, and it was the first time since 1986 that three drivers were in contention for the championship with only a single race remaining. The event was marked by treacherous weather, and was started under safety car conditions. Lewis Hamilton was the favorite with 107 points, followed by Fernando Alonso on 103 points and Kimi Räikkönen on only 100 points. Without some dramatic event, it seemed clear that either Hamilton or Alonso would win, with Räikkönen not being in contention. 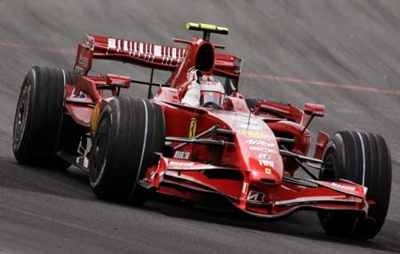 However, Hamilton slipped to the back, from 2nd, after a gearbox problem and, though he recovered to the 7th position, Kimi Räikkönen won the race and thereby the championship. Had Hamilton finished even 5th or below, he would have won the championship. The final standings were Räikkönen on 110 points followed by Lewis Hamilton and Fernando Alonso each on 109 points. In any assessment of great sporting moments of the 20th Century, the fourth set tie break of the 1980 Wimbledon Gentlemen’s Singles final, between the defending champion Bjorn Borg of Sweden and John McEnroe of the USA, has earned an unchallenged place. 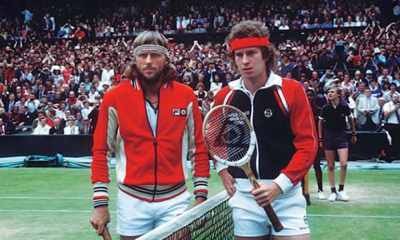 The 1980 final began badly for Borg, as McEnroe swept through the first set 6-1, and was frequently in a strong position in the second. However, Borg took the second and third set to lead two sets to one, with the final now almost two hours old. Soon, the fourth set tie break was a reality. Match points and set points followed, in a tantalizing sequence with Borg first reaching match points at 6-5 and 7-6. McEnroe, next, held and lost two set points before Borg, even more agonizingly, missed three match points as McEnroe dealt with them firmly, with a sequence of a great serve, a net cord and a volley. McEnroe now stayed out in front, holding and losing four set points before capturing the set on his fifth chance. Against Borg’s serve, McEnroe’s viciously top spun return produced a volley error from the Swede – and the match was all square after just over three hours on court. Borg went for broke in the deciding set, hitting eighty per cent of his first serves, and losing only three points on serve in the entire set. McEnroe contributed fully to this astonishing final and twice served to save the match. But Borg, cold-eyed within sight of a title which would make him the first to win five in a row since the abolition of the Challenge Round, finally reached his eighth match point when McEnroe missed a low volley. A backhand passing shot ended it and Borg was Champion by 1-6, 7-5, 6-3, 6-7, 8-6. At the 1996 Masters, Jack Nicklaus predicted that amateur Tiger Woods would win more green jackets than Nicklaus and Arnold Palmer combined. Golf scribes rolled their eyes. A year later, Jack looked prophetic. Playing in his first major as a pro, Woods made Augusta National beg for mercy. “He’s taking the course apart,” Nicklaus said. Tom Watson called him “the type of player who comes around once in a millennium.” Woods possessed more than brute strength – he had a killer instinct and a killer short game, and never three-putted on the course’s treacherous greens. He began Sunday with a nine-shot lead, and ended the day with a four-footer for par, a fist pump and a slew of tournament records: youngest champion (21), lowest four-day score (270) and largest margin of victory (12). Woods also became the first minority golfer to win The Masters. “I wasn’t the pioneer,” Woods said. “Charlie Sifford, Lee Elder, Ted Rhodes – those are the guys who paved the way.” Pioneer or not, Woods was the new face of golf. 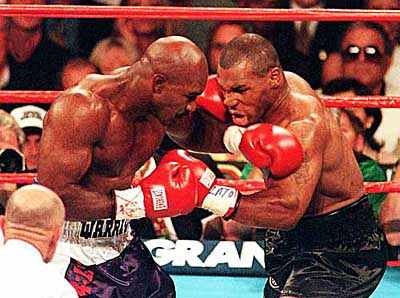 Termed as Tyson-Holyfield II, the fight began with Holyfield dominating Tyson. Tyson had repeatedly complained about head-butting in the first bout between the two. As the third round was about to begin, Tyson came out of his corner without his mouthpiece. The referee ordered Tyson back to his corner to insert it. Tyson inserted his mouthpiece, got back into position and the match resumed. Tyson began the third round with a furious attack. With forty seconds remaining in the round Holyfield got Tyson in a clinch, and Tyson rolled his head above Holyfield’s shoulder and bit Holyfield on his right ear, avulsing a one-inch piece of cartilage from the top of the ear, and spitting out the piece of ear on the ring floor.The fight was delayed for several minutes as Lane debated what to do. Lane’s original inclination was to immediately disqualify Tyson, but after the ringside doctor determined that Holyfield was able to continue despite the bite, Lane announced he would be deducting two points from Tyson and the fight continued. During another clinch, Tyson bit Holyfield’s left ear. Holyfield threw his hands around to get out of the clinch and jumped back, but the two men continued fighting until time expired. The men walked back to their respective corners when the fight was then stopped. As a result of biting Holyfield on both ears and other behavior, Tyson’s boxing license was revoked by the Nevada State Athletic Commission and he was fined $3 million, plus legal costs, and was almost sentenced to prison. It was, quite simply, the greatest clutch sequence in basketball history. Trailing Utah 86-83 with 41.9 seconds left, Chicago was in danger of facing a Game 7 on the road, with Scottie Pippen severely limited by back pain. Then Michael Jordan delivered. First, MJ hit a driving layup to cut the lead to one. Then he stripped Karl Malone from behind in the post, and calmly dribbled upcourt. After a stutter-step and a crossover dribble, Jordan launched a championship-winning 20-foot jumper over a fallen Bryon Russell. After a time-out, Stockton’s three-point attempt hit the rim and bounced away, giving the Bulls their sixth NBA title in 8 years. Jordan, who scored 45 points, and whose game-winning shot has been immortalized around the world, was named the Finals MVP. BASEBALL has moments. Football has drives, basketball has runs, hockey has … I dunno what hockey has. But I know this: Baseball has moments. Moments of suspense. Followed by moments when everything changes. Some 50 years ago, Brooklyn Dodgers pitcher Ralph Branca threw a smoky fastball up and in to New York Giant, Bobby Thomson, who turned on it like a farmer wielding a machete. The Dodgers had led 4-2 in the bottom of the ninth. Two Giants were on base when “The Shot Heard `Round the World” disappeared into the left-field stands at the Polo Grounds. As a result of the “shot”, the Giants won the game 5–4, defeating the Dodgers in their pennant playoff series, two games to one. “The Giants won the pennant. 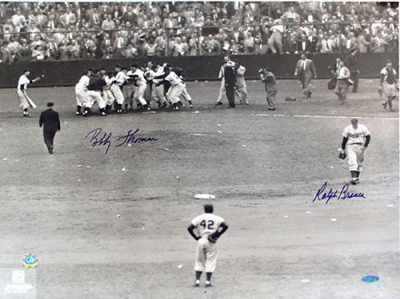 The Giants won the pennant”, and October 3, 1951, became a frozen moment in baseball history. The 2003 Rugby World Cup Final was between England and Australia. The final was closely contested with both teams showing exceptional perseverance. Elton Flatley of Australia had tied the game at 14 each with a penalty goal on the 80th minute taking the game in to extra time. Jonny Wilkinson then kicked a penalty in the 82nd minute, the score then 14-17. Flatley kicked a penalty in the 97th minute, and the score drew level once again at 17-all. 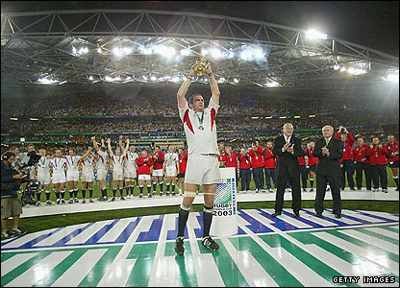 With only a minute remaining in the game, the ball was returned to England from a Mat Rogers kick, and with only 26 seconds on the clock, Wilkinson kicked a final drop goal, making the final score 17-20 and clinching the trophy for England. A national day of celebration was held on Monday, December 8, for the English rugby team, and hundreds of thousands of fans lined the streets of London to pay tribute to the English team. The English squad were also invited personally by the Queen to Buckingham Palace, and this was followed by a reception at Downing Street with, then, Prime Minister Tony Blair . 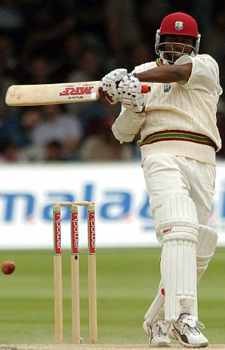 In a sport in which hitting a century (100 runs) in one innings is an extraordinary achievement, Brian Lara’s 375 runs against England last week was, well, Ruthian. From April 16 to April 18 the crease belonged to Lara and Lara alone. A 5’6″ lefty, Lara faced 537 balls from five English bowlers and hit 45 fours. His at bat was “chanceless,” meaning that, until he was put out, he never allowed a ball to get anywhere near the wicket, nor did he hit anything close to a catchable fly, the two most common ways to get out in cricket. Lara batted without interruption, not counting various stoppages for such necessities as lunch and tea—cricket, after all, did originate in England—for 12 hours and 46 minutes before being dismissed. In the wake of Lara’s 375-run tally, Trinidad and Tobago was—if such a thing can be said of a country comprising two neighboring islands—beside itself. On Thursday the prime minister, Patrick Manning, was at Port-of-Spain’s Piarco International Airport to laud Lara and his mates. It was announced that the next day would be recognized as a Day of Achievement in Lara’s honor, NATUC, the country’s national trade union, canceled a nationwide strike it had planned some time ago for that day. Besides receiving the Trinity Cross, Trinidad’s highest honor, Lara was also given real estate. 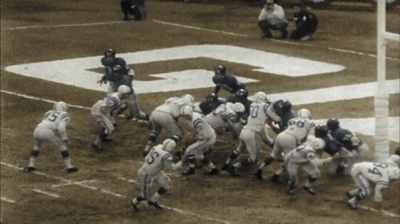 Often known as “The Greatest Game Ever Played”, the 1958 National Football League Championship game between Baltimore Colts and New York Giants, was nothing less than spectacular. There’s no denying that the excitement of the back-and-forth battle reached epic proportions as quarterback Johnny Unitas led the Colts’ offense onto the field late in the game. With the clock ticking, the Colts began from their own 14-yard line. After two incomplete passes, Unitas connected with halfback Lenny Moore on an 11-yard play to start moving the offense up the field. Johnny U. missed on a long pass to L.G. “Long Gone” Dupre, before turning to his favorite target. On second-and-ten, he found Raymond Berry for a 25-yard gain to midfield. Then, Unitas looked down the left sideline and connected with Berry for another 15 yards. One more Unitas-to-Berry hook-up, which was good for 22 yards, put the Colts at the Giants’ 13-yard line. With seven seconds to play in regulation, kicker Steve Myhra trotted onto the field and booted the 20-yard field goal to send the game into overtime. It marked the first time in league history that a championship game would be decided in sudden death. The Giants won the coin toss, but were forced to punt after they went three-and-out. Seizing the opportunity, Baltimore’s offense methodically controlled the ball and moved 80 yards on 13 plays. History was made when fullback Alan Ameche punched through the line on a one-yard, game-winning touchdown after 8 minutes and 15 seconds of overtime to give the Colts a 23-17 win and the NFL title. The game marked the beginning of the NFL’s popularity surge, and eventual rise to the top of the United States sports market. Eventually 17 players would be inducted into the Pro Football Hall of Fame. Arguably the greatest football moment has to be Manchester United’s triumphant comeback over Bayern Munich in the 1998-1999 champions league final. Manchester United were trailing 1-0 at the end of 90 minutes. United won a corner just as the fourth official indicated three minutes of injury time, and in a last-ditch attempt at an equalizer, Peter Schmeichel ventured up to Bayern’s penalty area. At this point, ITV commentator Clive Tyldesley asked: “Can Manchester United score? They always score!”. Beckham flighted the corner in just over Schmeichel’s head, Dwight Yorke put the ball back towards the crowded area, and after Thorsten Fink failed to clear sufficiently, the ball arrived at the feet of Ryan Giggs on the edge of the area. His right-footed snap-shot was weak and poorly struck, but it went straight to Sheringham, who swiped at the shot with his right foot, and nestled the ball in the bottom corner of the net. The goal was timed at 90:36. It looked as if, having been behind for most of the match, United had forced extra time, with Tyldesley declaring “Name on the trophy!”. Less than 30 seconds after the subsequent kick-off, United forced another corner, but Schmeichel stayed in his penalty area this time. Beckham again swung the corner in, which was headed downwards by Sheringham. Solskjær shot out a foot and poked the ball into the roof of the Bayern goal for United to take an astonishing lead. The goal was timed at 92:17. Solskjær celebrated by sliding on his knees, mimicking Basler’s earlier celebration, before quickly being mobbed by the United players, substitutes and coaching staff. Schmeichel, in his own penalty area, famously cartwheeled with glee. Tyldesley’s commentary on Solskjær’s goal is famous among Manchester United fans for its direct nature: “Is this their moment? Beckham… into Sheringham… and Solskjær has won it!” Tyldesley again followed this with the exclamation, “Manchester United have reached the Promised Land.” It had looked so certain that Bayern Munich would have won the cup that Bayern ribbons had already been secured to the trophy in preparation of the presentation ceremony. When the trophy was presented to Manchester United, the captain on the night, Peter Schmeichel, who had just finished his final match for the club, and manager Alex Ferguson raised the trophy together.